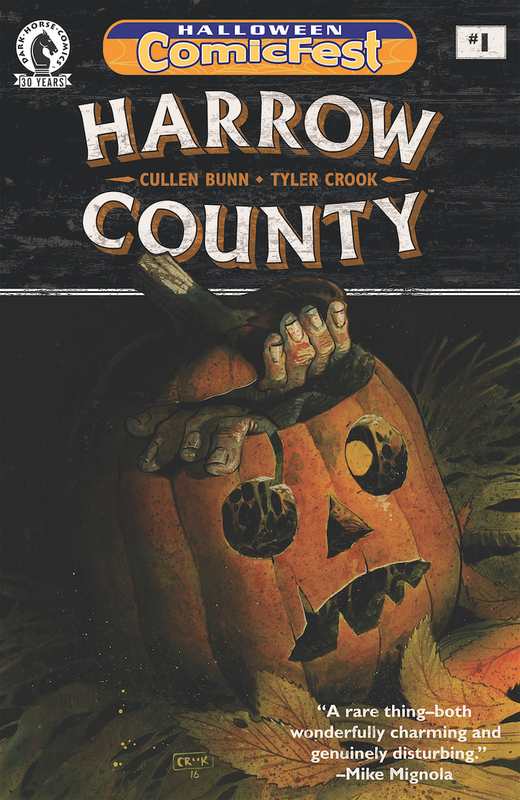 Dark Horse is proud to announce that Harrow County #1 is being offered as part of the fifth Halloween ComicFest celebration. The heart-stopping thriller from the creative minds of Cullen Bunn and Tyler Crook is one of 32 titles — 19 full-sized comics and 13 minicomics — available for the October 29, 2016, event. 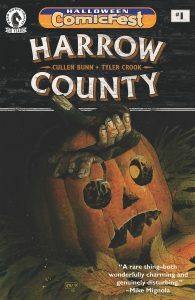 Harrow County #1 will be rereleased with a special Halloween ComicFest cover. A favorite of critics and fans alike, Harrow County is a must-read comic in the horror genre. Hailed by Bloody Disgusting as a “masterful creation that lingers in the small moments of terror in our daily lives,” Harrow County, a 2016 Will Eisner Award Nominee for Best New Series, is the perfect example of a southern gothic fairy tale. Halloween ComicFest, sponsored by Diamond Comic Distributors, encourages pop culture fans to visit their local comic shop to receive free comics and enter the Greatest Halloween Costume Contest on Saturday, October 29, 2016.